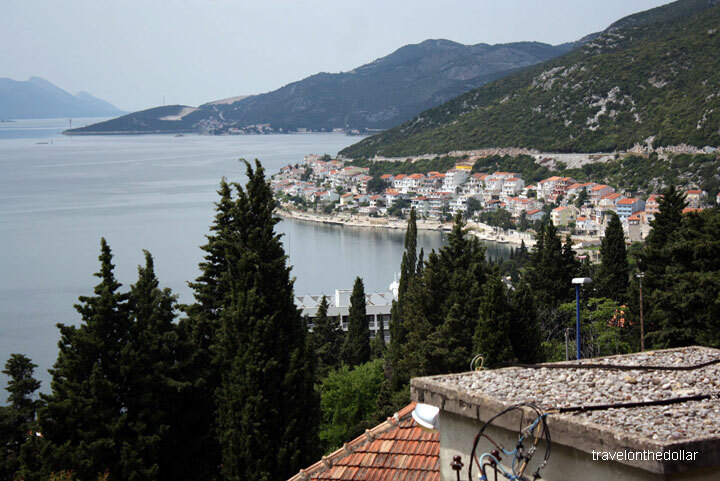 The morning routine was pretty much the same – breakfast at the cafe next to the apartment, get ready and we were out for the last leg of our trip to Dubrovnik. 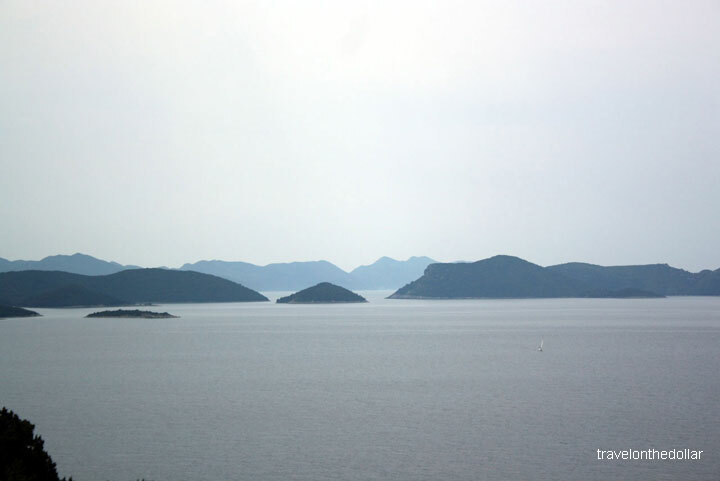 The bus ride from Split to Dubrovnik is on highway 8 all the time and is spectacular all the way. 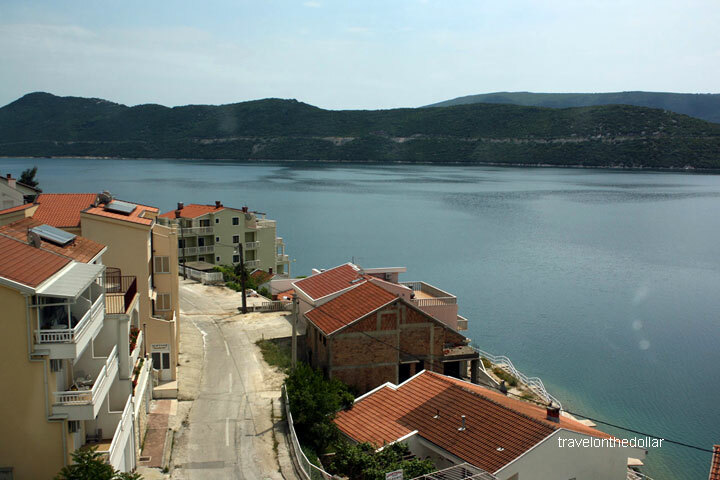 The bus passes through a lot of small towns and the one that is really picturesque is Omiš. Just passing through the town makes you want to stop there and take a lot of pictures, so make sure to keep your camera ready! 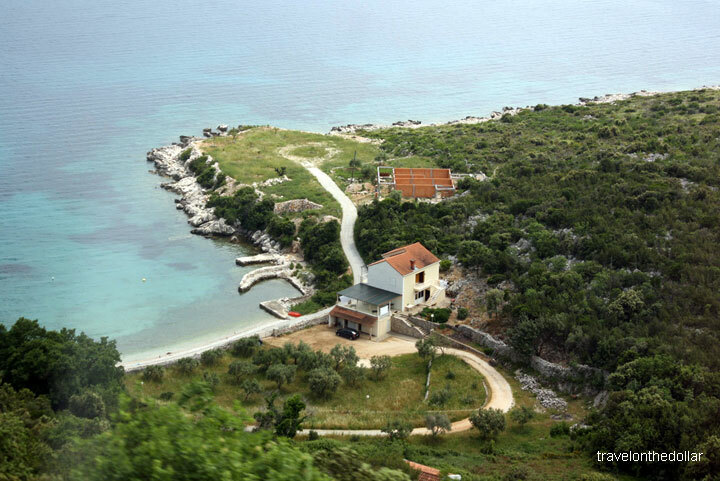 Although the bus does not stop at Omiš, you can still take some clicks on your way. 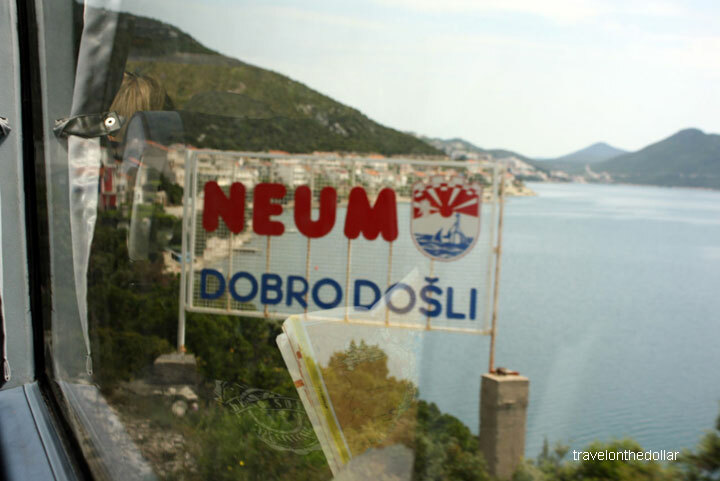 Another interesting thing about the bus ride is that all road transport to Dubrovnik passes through 26 km of the Bosnian town of Neum. 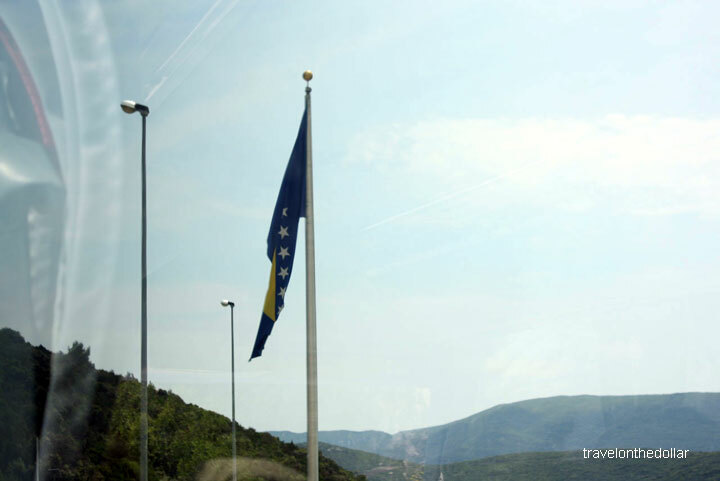 Police officers may board the bus and you may be asked for a valid identity document when crossing the Neum corridor which belongs to Bosnia and Herzegovina. While the bus companies list trip duration of approx. 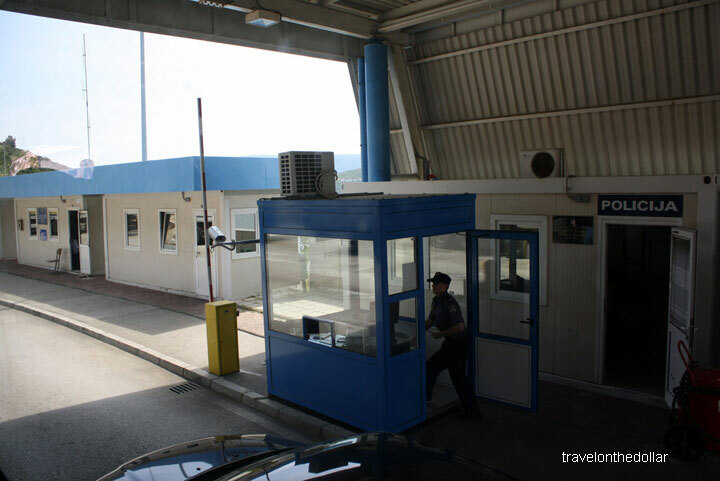 4 hr, be prepared for a ride of closer to 5.5-6 hr, including Bosnian border checks. 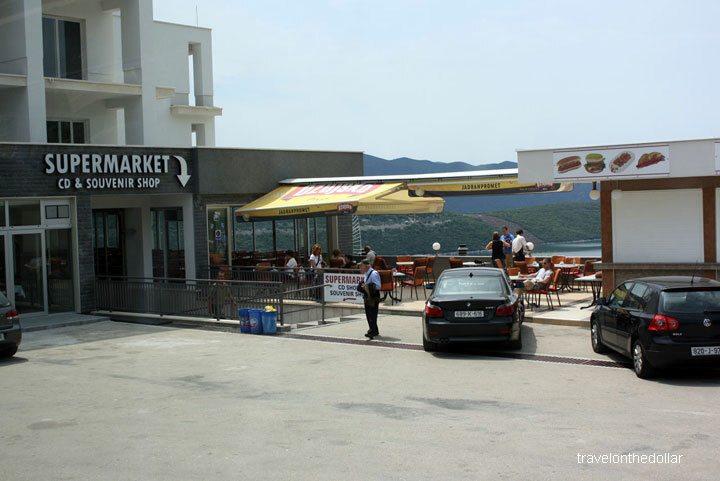 The bus stops at a cafe in Neum for 30 minutes. 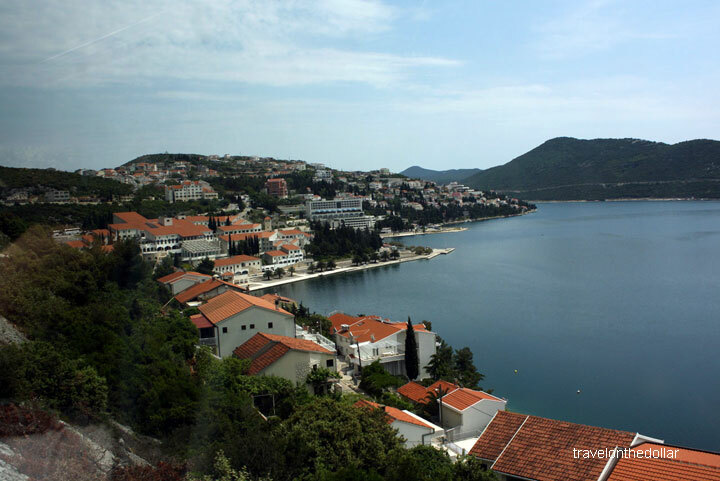 If you’re traveling to Croatia on a visa then you don’t need a separate visa for Bosnia & Herzegovina. 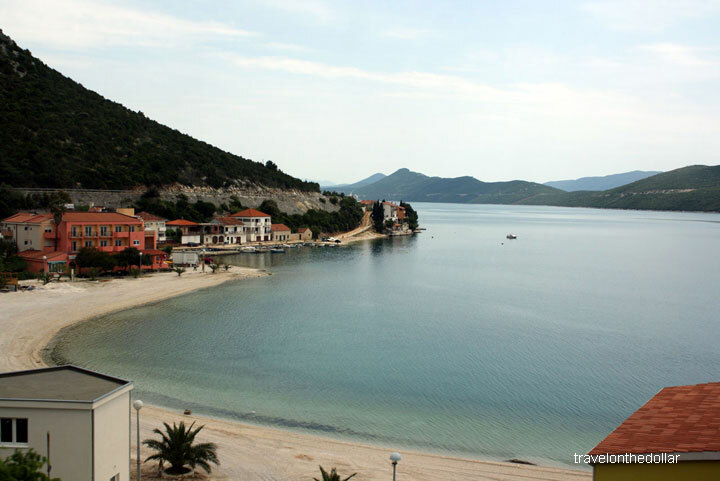 Your Croatian visa is good for that part. 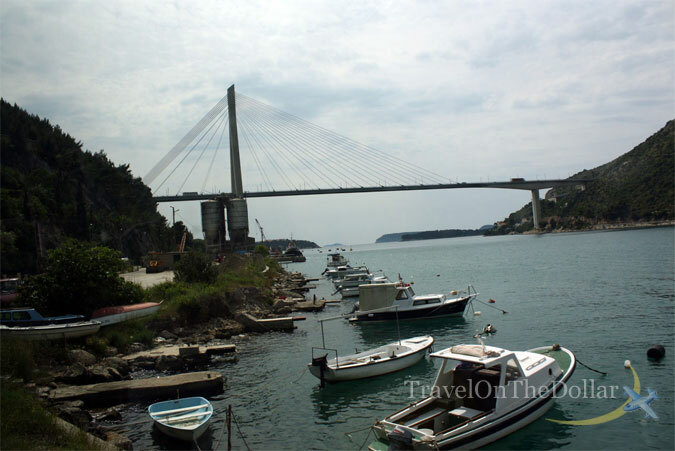 Another hour and you will see the massive Tudjman bridge leading to the city of Dubrovnik, which also has the port of Dubrovnik where the tourist ferries dock. 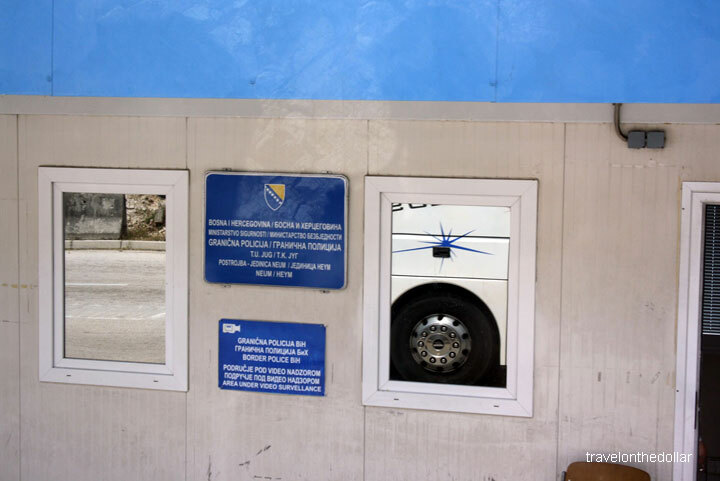 The Autobusni Kolodvor (bus station) in Dubrovnik is not close to the fortified Old Town, so either you can take a bus #2 to the Pile Gate or just take a cab (HRK 60, 20 minutes). Upon reaching Pile Gate, you will see the high walls and a lot of tourist buses. Note that the frequency of bus #2 is less, so it’s best to take the cab. The first thing one would notice upon reaching outside the Pile Gate is hoards of tourists. 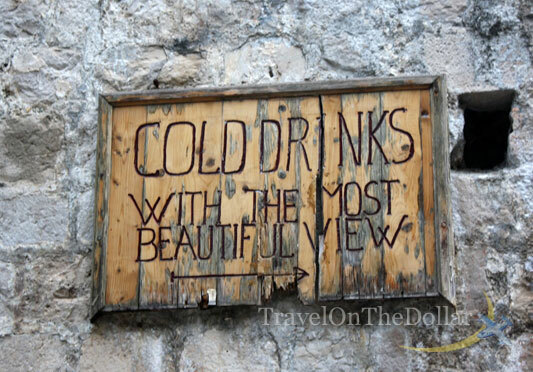 Dubrovnik is one of the main travel destination for Europeans, especially Italians, Germans and British. 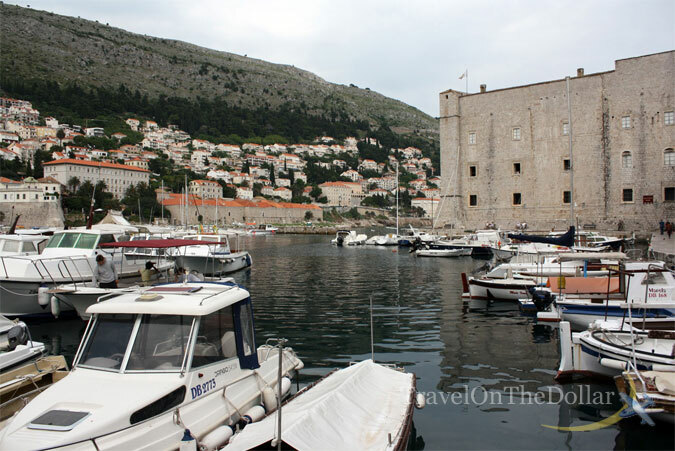 The Pile gate lies on the northwest end of the Dubrovnik Old Town and is the main entry point for all tourists who arrive by ferries or buses. 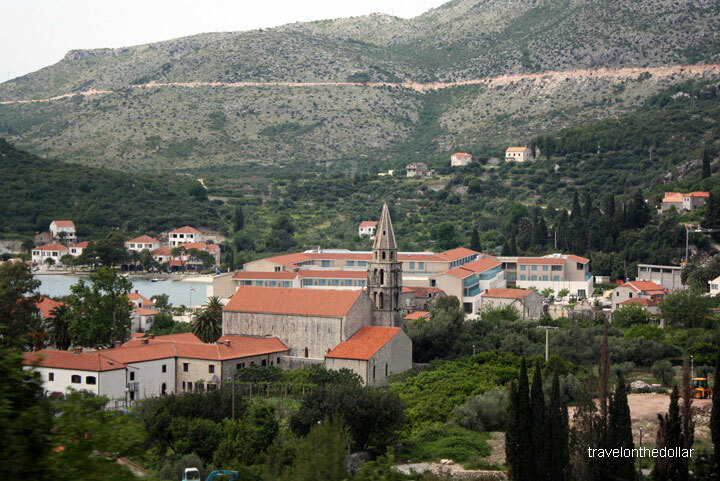 This is one of the three gates to enter the Old Town – Pile Gate, Ploče Gate and Buža Gate. 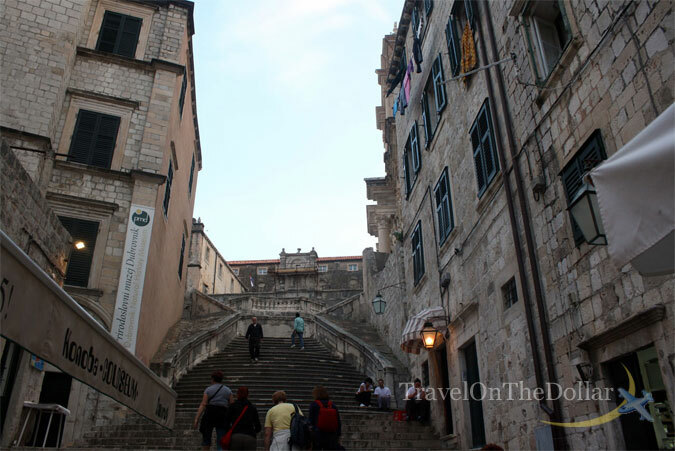 Entering the Pile Gate will directly lead you to the main street of Old Town – Stradun. We wanted to check-in to our apartment to with the help of iPhone Maps we headed to Zakom 3. 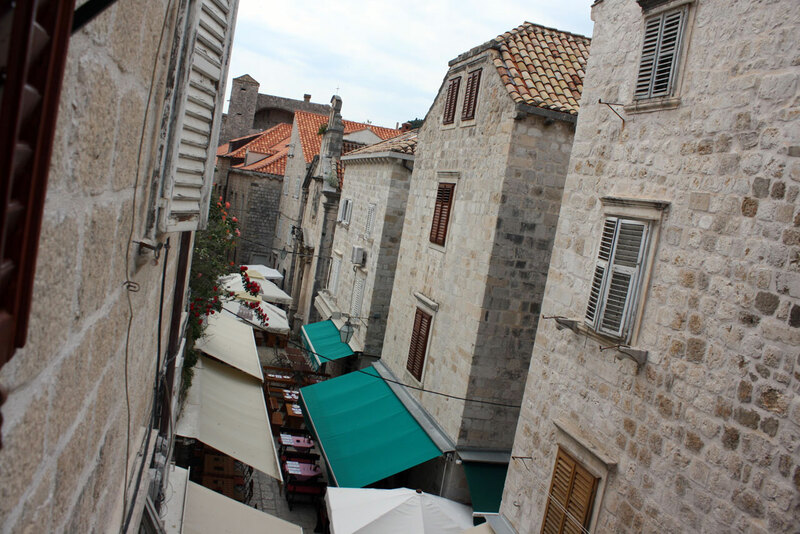 Meddling our way away from Stradun in to the cobbled and narrow streets of Dubrovnik Old Tow, lined up with cafe’s and restaurants, we reached to our apartment where we were received by Viktor. 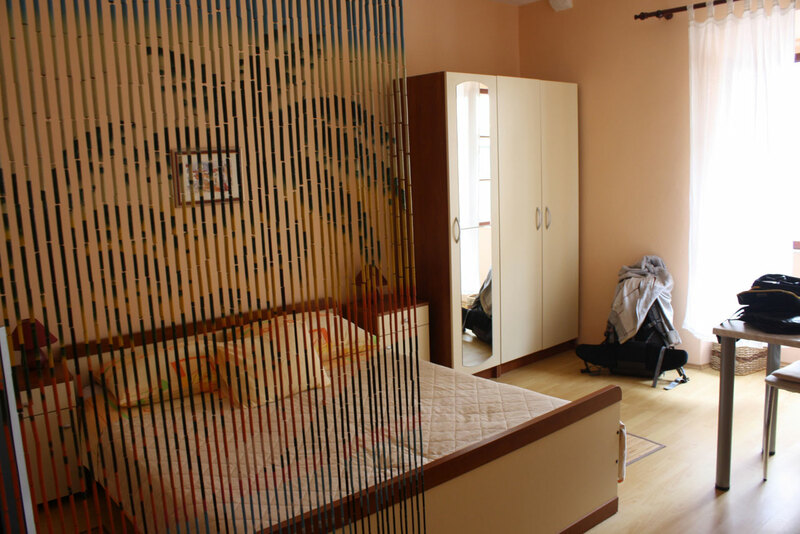 The beautiful apartment was on the second floor with a window looking over the Zakom street. After a quick fresh-up, we headed out to experience this gorgeous town and to grab a bite. There are ample restaurants to choose from along the Stradun, but if you walk around a bit you can get different flavors in the tiny and narrow side-streets of the Old Town. 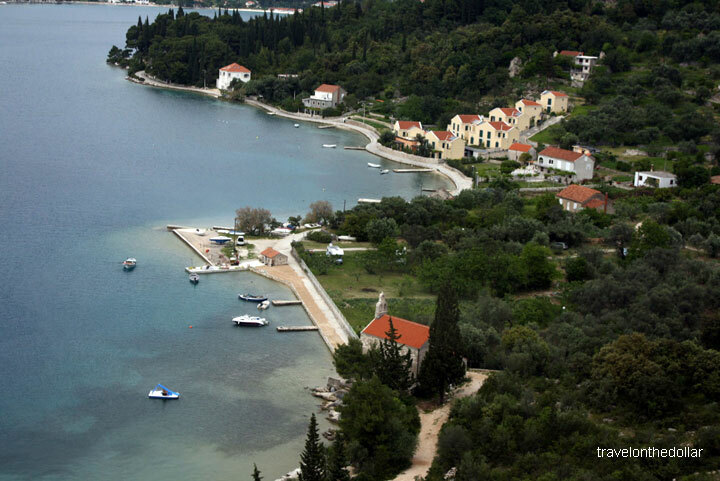 The place we decided to eat at is one of the most recommended restaurants in Old Town, right at the fisherman’s port – Lokanda Peskarija. 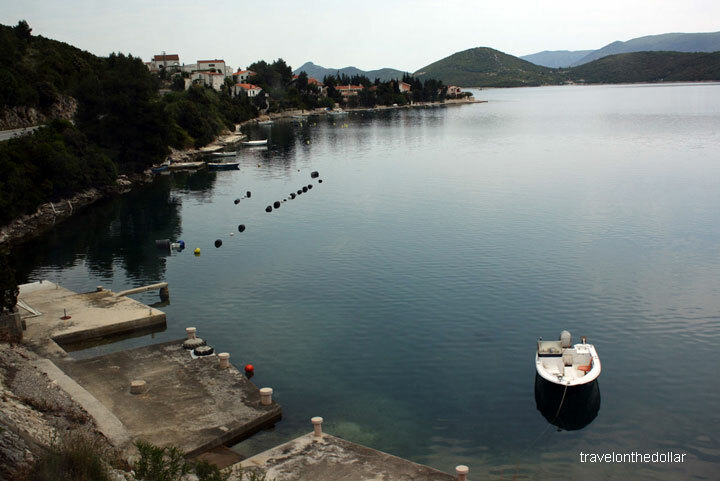 This outdoor restaurant with views of the walls on one side and the hills on the other, you are sitting with hundreds of fishermen boats parked in the bay. Try the seafood platter (HRK 160 for 2 people) – this comes in a huge pan filled with mussels, prawns, sardines, octopus and squids. 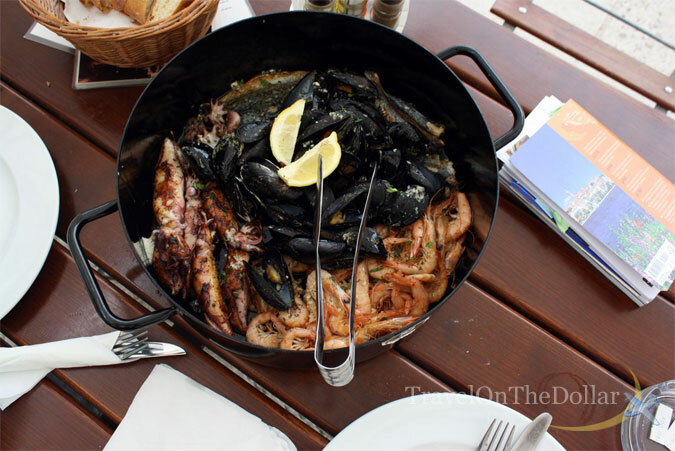 The meal is the best we have had in Croatia! We finished our hearty lunch at around 3:30pm and were back in the Old Town. It being Friday afternoon, more tourists were being off-loaded in the city. We walked on the Stradun experiencing this magnificently restored Old Town, which was destroyed after the 1991-92 war. 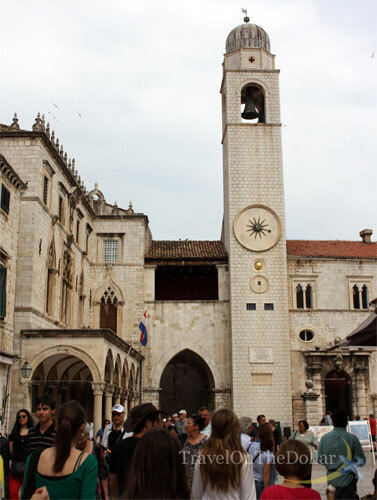 First stop – the Bell Tower at the southeast end of Stradun, next to Ploče Gate. On top of the tower are the famous ‘Zelenci’ (The Green Ones), bronze statues which strike the gigantic bell every hour. 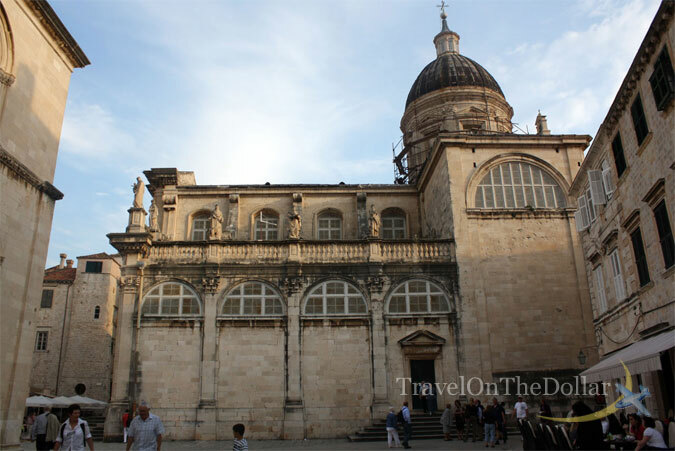 They have been recently replaced with copies and the originals are in the atrium of the Sponza Palace. 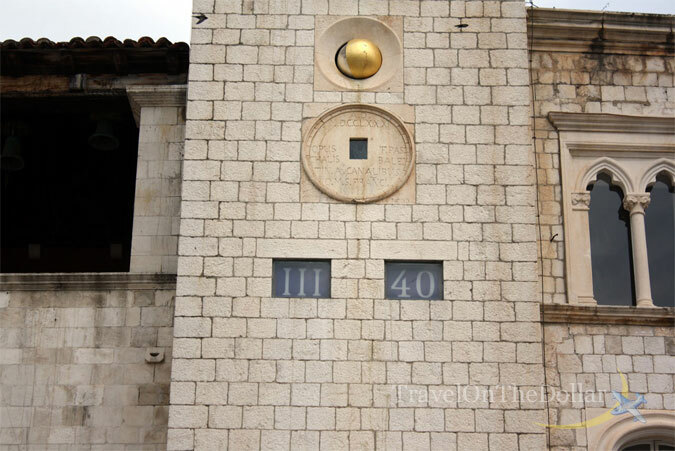 This tower also displays the time (in intervals of 5 minutes) with the hour in Roman numerals and minutes in numerics. Next on the list was Cathedral of the Assumption of the Virgin Mary (Mon-Sat 8am-8pm, Sun 11am-5:30pm). Supposedly, the original church was built with money donated by Richard the Lionhearted who survived shipwreck on his way home from the Third Crusade. 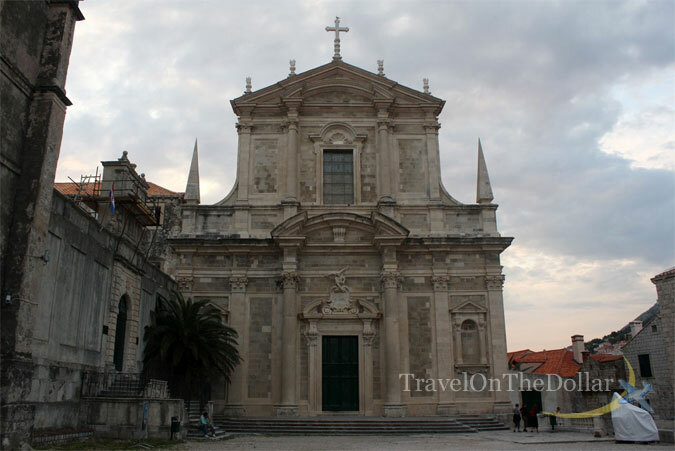 The current Roman Baroque cathedral dates from the 18th Century. Right across the Bell Tower is the Church of St. Blaise, which is built on the plan of a Greek cross and topped with a grand dome. Its wide staircase is a popular place for weary tourists to take a load off and people-watch for awhile. Inside the church are numerous art treasures saved from the earlier church, including a gold-plated silver statue of St. Blaise, holding a 15th-century model of the city, on the main altar. In front of the Church is Roland’s Column, (actually in front of the Bell Tower). A slender stone flag staff of the legendary knight. Also known as Orlando’s Column. 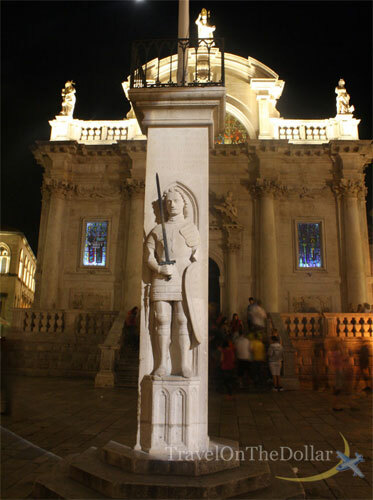 Ever since its foundation in 1950, the Dubrovnik Summer Festival is officially opened by raising a flag carrying the city’s motto Libertus on Orlando’s staff. 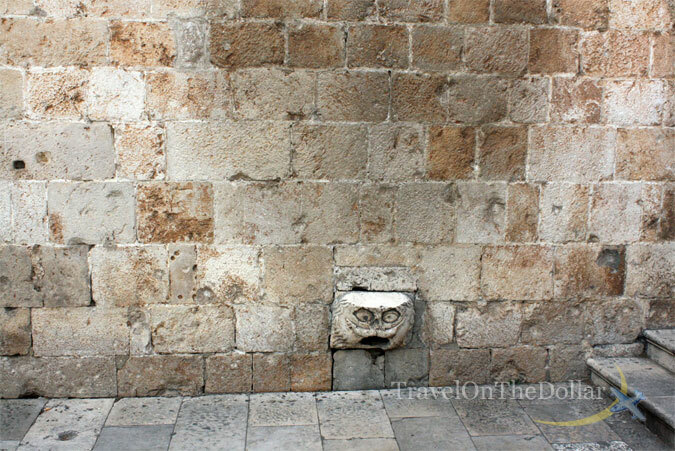 Moving to the other end of Stradun, we stop at the Big Onofrio’s Fountain right inside the Pile Gate. 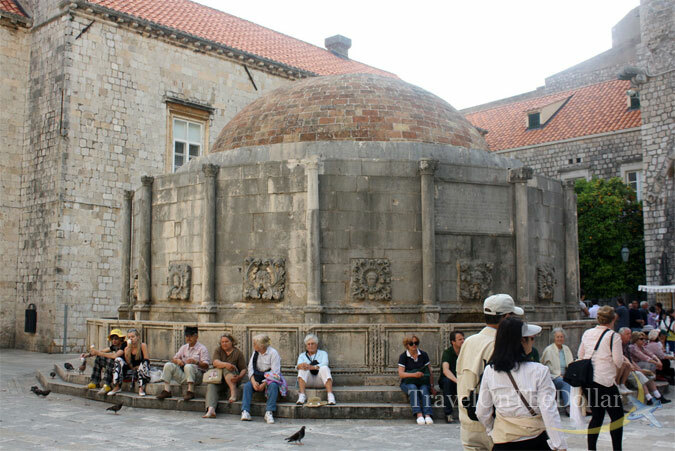 Behind the Big Onofrio’s Fountain is the Tourist Information office (TI). 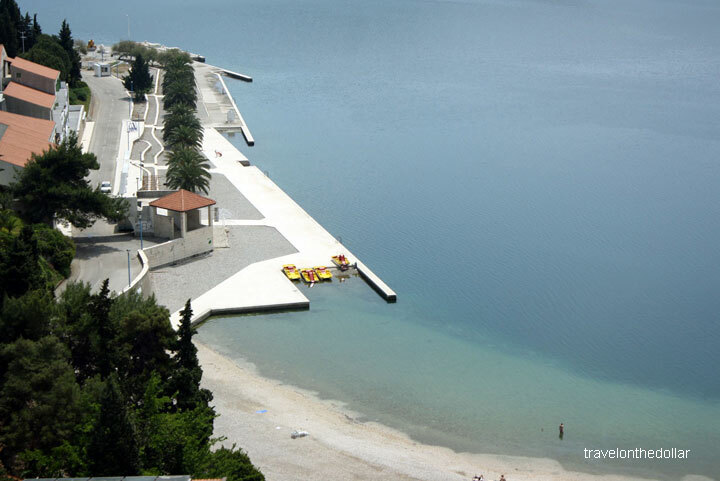 This is the main meeting place for locals and tourists. It’s 16 sided water spouts get water from 20 kilometers away. Right next to the fountain, on the walls of Franciscan Monastery is a single lion-head with a flat head. This is a strange gargoyle head protruding from a stone wall. It’s on the left side, just next to the entrance to the Franciscan monastery and the stairway that leads up onto the city’s famous walls. The head stands some half a meter above the ground, sticking out barely fifteen centimeters. Its top surface is polished like marble. The wall above it is noticeably greasy from the touch of a thousand hands. The head was supposed to represent an owl. It was once the end of a pipe that drained rainwater from the top of the building. 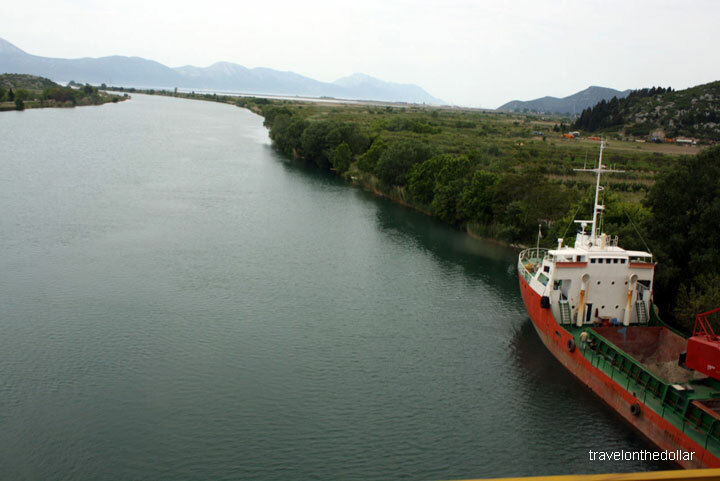 The pipes were rerouted a long time ago, and water doesn’t flow from its mouth anymore. Legend has it that if you manage to hop onto the head, keep your balance, and take off your shirt while still standing facing the wall, luck in love will follow you. 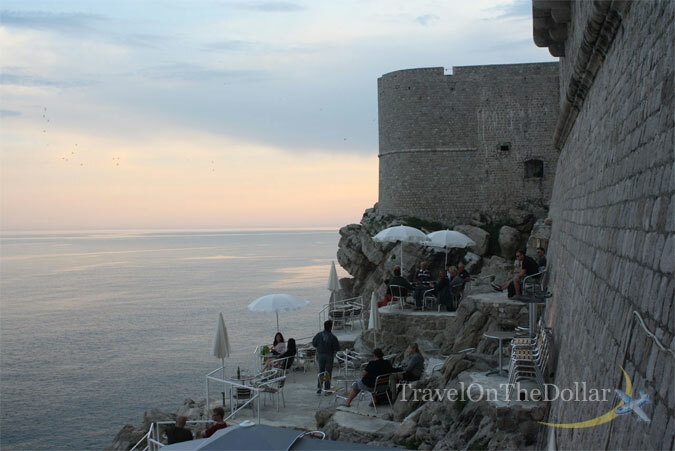 A quick walk out of the Pile Gate and back, it was almost time for sunset and and the best views of the sunset can be seen at Cafe Buža, which is located outside the walls overlooking the Adriatic Sea. 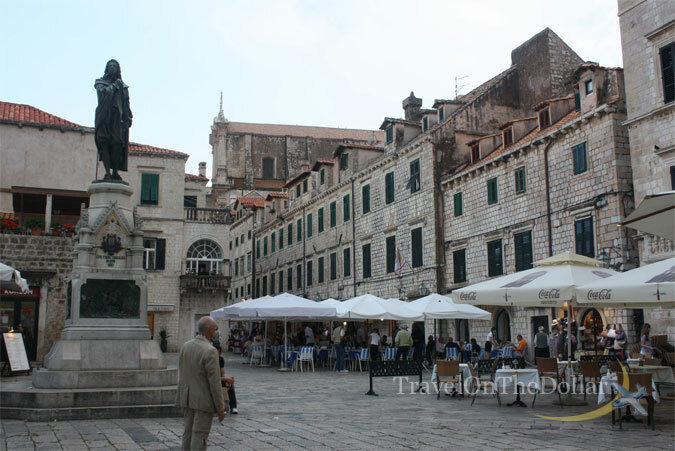 To reach the cafe, head over to the Gundulić Square. This is where one finds the morning open market. From the Square, climb the steps up to the Jesuit Church and the historic Collegium Ragusinum. 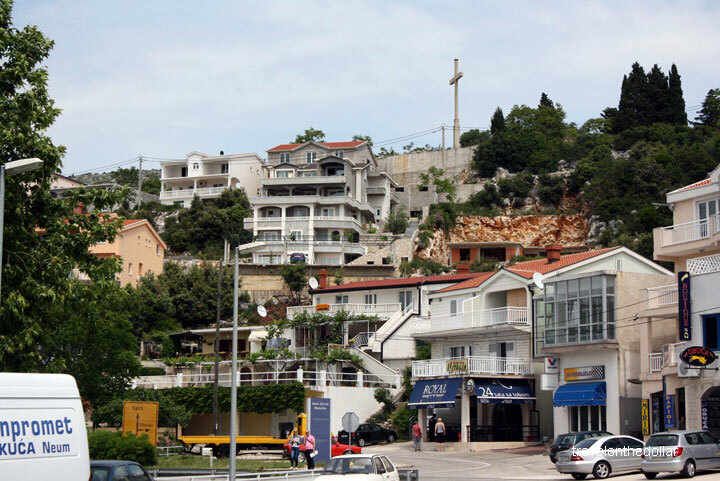 At the top, you will be in an open space called Bošković Square. 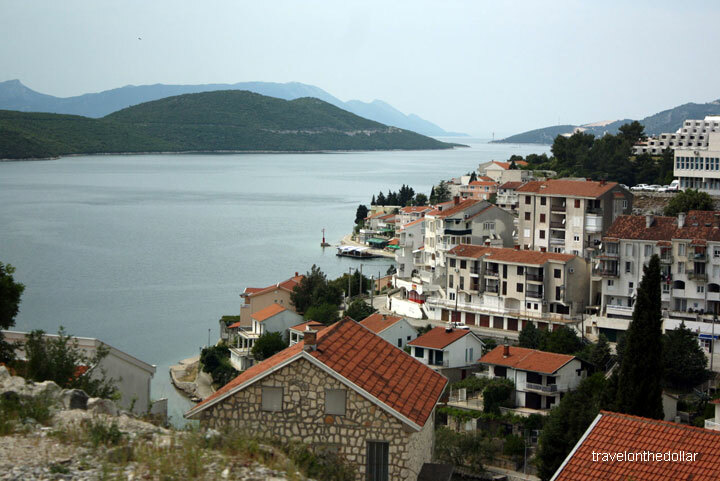 With the stairs at your back, turn left and cross the square to the Wall, on which you will find a wooden sign with an arrow that directs you to the right, along the Wall, toward Buža. The huge square up the stairs has the Church of St. Ignatius and the Jesuit College. Ornate Jesuit church, approached via a romantic baroque staircase modelled on the Spanish Steps in Rome (1738). Built between 1667 and 1725 by architect Ignazzio Pozzo, and like most Jesuit churches of the period was modeled on the Gesù in Rome, the mother church of the Jesuits. Mass held in English daily at noon in the summer. Along the short walk that remains, you will encounter a small, make-shift football (soccer) pitch on which the neighborhood boys have their pick-up games. The Wall will be on the left and a small chapel will be on the right. As you might imagine, the young players are very accustomed to visitors regularly crossing the pitch; simply continue to walk up the street past the small chapel. 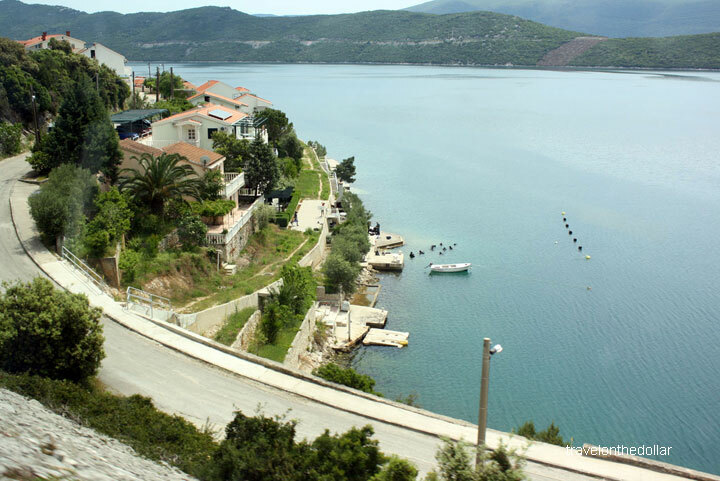 A short walk further and, on the left, you will find a buža (hole) in the wall through which, depending on the time of day, the sun may penetrate. 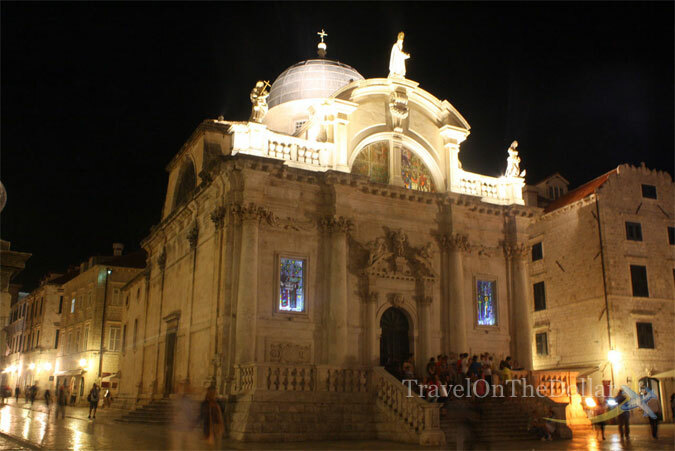 After a few drinks and a laid back evening, we headed back to the Stradun, strolling through the narrow streets of Old Town Dubrovnik. A few hours experiencing the lit streets, we headed to the apartment looking forward to the walk on the walls, an island hop and some Tiramisu.